The historic Hammerstein Ballroom, located within the Manhattan Center in Midtown Manhattan, was built in 1906 by Oscar Hammerstein. The magnificent former opera house, recently renovated, boasts a soaring 75-foot ceiling, a spacious 12,000 square foot interior, and excellent acoustical design. In the heart of Manhattan, the Hammerstein is ideally located within walking distance to Herald Square, Penn Station, and Times Square. 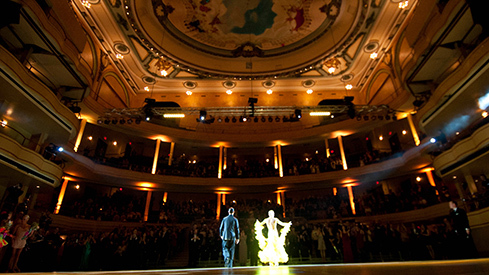 Join us in April at this renowned New York City landmark to witness the ballroom legends of the past, present and future! Call 866-800-3088 or 212-971-0101 and say you are a part of the group called "Dance Legends"